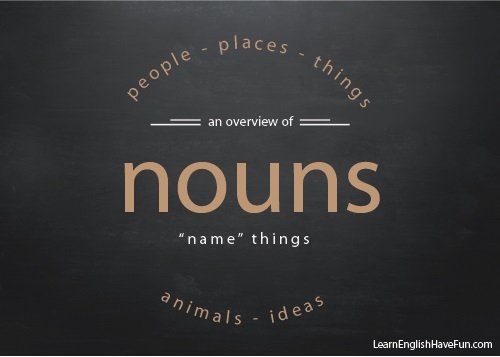 Let’s learn about nouns and how to use them correctly with fun exercises. First, we'll cover the different types including countable, uncountable, common, proper, abstract, concrete, collective, possessive, singular and plural. We'll also look at some of their different functions in sentences (subjects, direct objects, indirect objects, objects of prepositions). A noun is a word which names a person, place, thing, animal or idea. All nouns are either common or proper. Common nouns name general (not specific) people, places, things, animals or ideas. For example: teacher, scientist, library, kitchen, table, phone, happiness, love, freedom. Proper nouns name specific people, places, things and ideas. In English, proper nouns are normally CAPITALIZED. Abstract nouns name something you cannot see or touch. They're harder to define and name things that are related to ideas, feelings and time. Concrete nouns name things that you can physically touch or see. All common nouns can either be counted with numbers or they cannot be counted. Countable nouns can be easily counted. You could count the number of apples in a basket (e.g., 5 apples) or the number of desks in a classroom (e.g., 20 desks). The police found two hairs at the crime scene. My skin is very dry. The purse is made of several snake skins. I left some papers on the printer. Click here for more information about countable and uncountable nouns. Singular nouns name just one (single) thing. Plural nouns name more than one thing. There are regular and irregular plural nouns. Most nouns have a distinct (different) singular and plural form, however some nouns do not have a plural form. Collective nouns are made of more than one word which describe a group of people or things as one unit. Think of it as a collection of things together. For example: a herd of elephants, a crowd of people, a bunch of flowers. Compound nouns are made up of two or more words. However, If the noun ends in -s add an apostrophe ( ' ) after the -s.
Click here for more detailed information on possessive nouns. Subjects: A noun can be the subject of a sentence or clause, describing whom or what the sentence is about. Examples: Pizza is delicious. The boy ran through the park. Predicate nominative: A noun can rename the subject by completing a linking verb. Direct objects: A noun can receive the action of a verb. Example: I threw the football. Indirect objects: Nouns can receive the direct object. Example: I threw John the football. Object of the preposition: In a prepositional phrase, a noun can follow a preposition and complete its meaning. I threw the football to John. Object complement: here a noun directly follows and describes the direct object. Our coach named me team captain.